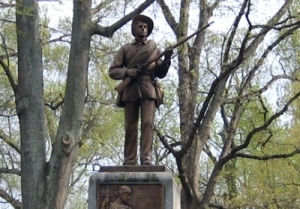 Attorneys for The University of North Carolina responded late Friday to a threatened federal lawsuit from students over “Silent Sam” – a Confederate monument on the Chapel Hill campus. The university’s response suggests students claiming that the monument creates a racially hostile learning environment take their complaint to the Equal Opportunity and Compliance Office at UNC-Chapel Hill but says the university disagrees that they have a valid Civil Rights claim under Titles IV and VI. “While we understand that UNC may not have unilateral authority to move Silent Sam, we do expect Chancellor Folt, as the leading representative of our UNC community, to vigorously advocate for the removal of Silent Sam and publicly acknowledge the statue’s connection to both white supremacy and racism. Every day that she continues not to do so, she is failing us. The latest example of Chancellor Folt’s failure regarding Silent Sam is the fact that UNC did not petition the N.C. Historical Commission, prior to tomorrow’s meeting, for permission to remove Silent Sam from campus.UNC could have petitioned the Historical Commission, and should have done so. And Chancellor Folt should have been out front, leading the effort.